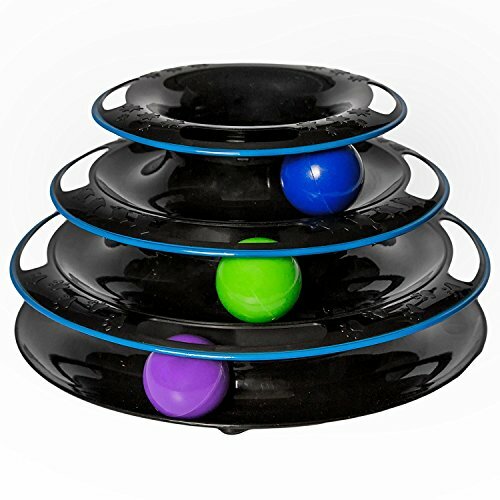 Easyology Amazing Roller Cat Toy - 3-Level Tower Ball & Track is currently selling at $14.99, which is its normal price. It has a lowest price of $14.99 and is selling within its usual range. Price volatility is 0.15% (meaning it does not change often), so you might have to wait a while for the price to drop. Until then this is a recommended 'ok deal'. There is a coupon available for an additional 10% off. The current deal is also the best price on this item over the last month. 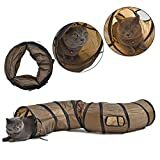 Compare the current price, savings (in dollars & percent) and Buy Ratings for the top Cat Toys that are closely related to Easyology Amazing Roller Cat Toy - 3-Level Tower Ball & Track. Here is how Easyology Amazing Roller Cat Toy - 3-Level Tower Ball & Track compares with other leading Cat Toys. Your feline friend won't be able to stop swatting them around in the 3-level track! So...if you have a few, this unique pet toy will be fantastic! Forget cheapquality, flimsy toys that can't withstand the teeth and persistent claws of your furry friend. Our WASHABLE and EASY TO CLEAN heavy-duty cat roller toy is made of the HIGHEST-QUALITY plastic material in the market and it's carefully constructed to give your cat ENDLESS hours of fun. 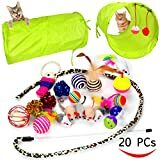 FeaturesSURE TO MAKE YOUR CAT GO CRAZY: Easyology Pets happily offers you a 3-level track & ball toy to keep even the pickiest cat entertained and engaged for hours. Your feline friend will never get bored trying to pry the three colorful balls out of their tower prison. And the best part...this 3-ball model is perfect for owners of more than one cat.KEEP YOUR CAT ACTIVE & HEALTHY: Our super-fun roller toy includes 3 balls which swirl around the tracks to mimic natural prey. It will stimulate your kitties both physically and mentally, preventing them from becoming destructive or misbehaved. It won't disappoint you!100% SAFE FOR YOUR KITTEN: Unlike other cat toys, Easyology Pets roller toy does not include any strings, yarn, ribbons, feathers or other ornaments that could pose a choking hazard. It can keep your cats happy while they're at home alone.CAN WITHSTAND EVEN THE ROUGHEST PLAY: Our heavy-duty tower track & ball toy is made of high-end ABS plastic material. Thanks to its super-sturdy, yet lightweight construction, this exciting kitten toy will still function and look as if new for many more years to come!